Curved or flat, for presentation or simulation, displays these days are not just about showing something—they’re about drawing the viewer in. Whether it’s to educate, entertain, train, collaborate, or innovate, the technology developers behind today’s immersive displays are pushing (and sometimes bending) the envelope to add new depth to what we see. Here are several of the latest examples of display technologies in the marketplace. Suitable for use in museums, theme parks, education facilities and broadcast studios, as well as for applications in industrial product design, manufacturing, and command and control, Sony’s Canvas display system is designed for use cases where large-scale, detailed images and realistic simulation are necessary. The system incorporates Crystal Light Emitting Diode Integrated Structure (CLEDIS), which uses ultra-fine RGB LEDs as its light source. Pixels are 0.003 mm2, and each pixel emits light independently. This means that the remaining surface area is “more than” 99 percent black, delivering a contrast ratio of 1,000,000:1. Its viewing angle is almost 180 degrees with corner-to-corner uniformity, and it can be scaled to comprise multiple display units that measure 18 by 16 inches each. (These units can be joined together without the use of bezels.) With a brightness of 1,000 cd/m2, Canvas will support High Dynamic Range (HDR) content, and will produce imagery with 10-bit color depth and a color gamut of about 140 percent of sRGB. Its pixel drive circuitry results in a frame rate of 120fps. Also from LG is the manufacturer’s OLED Wallpaper commercial display, with a “razor-thin” depth of 0.14 inches (3.65mm). Designed to become “one with the wall,” the 55-inch, 13-pound display can be mounted either vertically or horizontally, and produces Full HD (1920 x 1080) resolution. OLED Wallpaper also features 64GB of internal memory, content scheduling capabilities, and Wi-Fi connectivity with the use of a Wi-FI USB dongle. In celebration of the 50th anniversary of the Summer of Love, the de Young Museum in the Haight-Ashbury district of San Francisco, Calif., programmed The Summer of Love Experience: Art, Fashion, and Rock & Roll, an exposition showcasing cultural artefacts of the summer of 1967. Rich Rice, director of event and exhibition technology at the Fine Arts Museums of San Francisco, purchased 12 NEC PA803U projectors, which were used to present psychedelic light shows created by Bill Ham and Ben Van Meter. Mounted in landscape configuration, the NEC PA803U projectors were also used to present video footage of the Trips Festival––the three-day event led by Ken Kesey and his Merry Pranksters in 1966, which was focused on educating the public about LSD. The projected images were displayed on two screens that were stretched into semi-circles. In addition to the PA803U projectors, Rice also purchased two NEC MultiSync EA273WMI-BK 27-inch LED backlit LCD displays to show educational footage. Userful’s technology uses a single PC to distribute video to multiple displays (up to 100 screens, and up to 8K source content) over the network. At Smokin’ Joe’s, a pub in Sarasota, Fla., a six-display video wall was designed to resemble a real window: customers are treated to, for example, images of images of an aquarium, a snowy suburban street, or an above-the-clouds view of the sky, making one feel as if that’s what’s actually on the other side of the glass. Userful recounts that Brian Duarte, managing partner at Smokin’ Joe’s has reported a 24 percent increase in sales, and that he believes that the video wall has played a role in this. 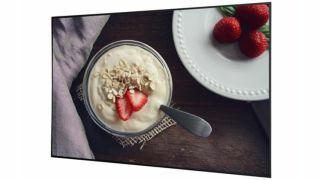 ViewSonic’s View Board family of interactive flat panels includes the IFP50 Series, featuring the IFP6550 (65-inch), IFP7550 (75-inch), and IFP8650 (86-inch) models with UHD 4K (3840 x 2160) resolution. Designed for boardrooms and classrooms, the displays’ 20-point touch screens are designed for collaborative sessions involving multiple users who may write or draw on the surface with either styluses, or their fingers—or both—simultaneously. Their computing power enables annotation and media playback without the need for a PC, and they come with a built-in ARM quad-core processor and an Android 5.0 operating system, as well as 2GB of memory and 16GB storage. ViewBoard Cast software (also built in) lets users share content from any mobile device onto the display; Zoom technology allows for video conferencing and distance learning; and vController software provides remote management. For educational applications, the panels support Qwizdom Oktopus and Ximbus collaboration solutions. Epson’s Pro L-Series of projectors, comprised of five models delivering from 12,000 to 15,000 lumens of brightness, are designed for both production and permanent installation. The projectors incorporate Epson’s 4K Enhancement technology, which shifts each pixel diagonally by 0.5 pixels. This doubles the resolution, and enables the projectors to accept 4K input, as well as enhance a 1080p signal. The series also includes a remote image capture feature with a built-in camera (to allow users to conduct diagnostics), and 360-degree installation capability with projection at any angle. In partnership with Refik Anadol, a media artist and designer, the L-Series projectors were used in an immersive art installation in Epson’s booth at the InfoComm show in Las Vegas, N.V. this past June.